While listening to "Down in the River to Pray" from the 'Oh Brother Where Art Thou' OST, I had a sort of serene, camera panning a scenery sort of feel. Given that the song kept singing about the river, it was sort of a no brainer. Having never watched the movie or committed myself into any sort of faith, my motivation was the song's strange effect on me to keep playing it over and over again. Notice the front is blurry and the back is not. Yeah, as I said earlier I had a camera panning a scenery idea in mind so I intentionally focused on the character at back. Never seen the anime either by the way so the reason I walled Haibane Renmei was because of the halos and wings... Acta sanctorum means Acts of the Saints and Est autem fides credere quod nondum vides means Faith is to believe what you do not see. I abused the stocks from imageafter.com and sxc.hu. Um yeah, why did it take so long and contain so many layers? Probably because I'm such a noob and couldn't figure out a way to do this in less than 20. Mostly for the background's 50 or so layers... Yay for crappy default grass brush. -_- Yeah... Comments, Criticism, Flying Tomatoes, or Candy appreciated. Heh... the background looks awesome. Has a lot of depth (something that I can't quite master yet). Anyway, it looks great, but 70+ layers? You serious, that seems way too many. The most I used was about 22 or something. But then again I'm still a noob though ;). Oh yeah I really like this wall. So cool and I like how it is blurry on bottom and not on top and it does show focus on the character in the back. The background and it's colors look great. Well great job! i really like the background it's so dark and yet there's the sun setting. 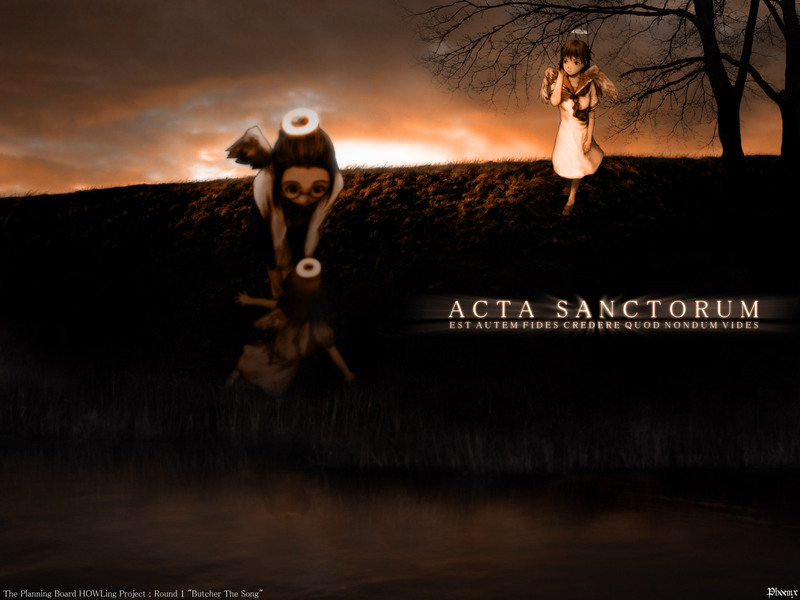 aaaaa, que hermoso anochecer, excelente wall de Haibane Renmei!